If you are planning a trip to Turkey it will work as snippet-preview of what you should be looking for walking through the markets (well, if you are actually reading this blog, I assume you’re the kind of person it will certanly spend the most of the trip walking through turkish markets, am I right?). Also, if you know someone is going to make this trip instead of you, this is some tip to what to ask for to casually drop in the luggage as souvenir ( if you are the that kind of person, as I am, that stresses her friends every time they travel anywhere to bring back some strange spice, cheese or whatever the destination has to offer). It’s a fact: Turkey is a mediterranean country. This means the curious traveller coming like us from neighbor Spain, probably won’t be driven mad for the variety of products you can find in the markets, but you will certainly be amazed by their MARKET CONCEPT itself. No matter if labirintic bazars or open-air stands, it will always be an adventure to walk through them (and of course get lost) and I have to point the fact the QUALITY is really HIGH: fruits and vegetables are incredibly tasty. I mean for real: the rucula literraly “burns” your mouth, you can eat cucumber just as it is, tiny and savory and never be afraid of try a tomato, it won’t never disappoint you..! It doesn’t need to be organic to be tasty basically. Turquía is a real culinary treasure, heritage of the humanity. It’s well considered one of the first fusion-cuisine of the history, when the term “fusion” wasn’t even invented. Flavours and mediterranean colors, strong oriental soul and a shade of India..hocus pocus, voilá: that’s turkish cuisine. So with such a genetic, of course the key-factor are herbs, nuts & spices. They have mountain of spices, you can literally find all the dictionary in those mountains of spices. It’s something impressing to see, not just if you are a foodie. It’s fascinating in a anthropological way, seriously. How lucky I am to live in Lavapiés, (the most multikulti barrio of Madrid where you can easily find quite any kind of spices, herbs or cereals you need to cook with) so I didn’t fly back from Turkey with a bag full of ground coriander, nigella seeds or any class of bulgur etc..but yes, I made some space for these 5 flavors because I realized there are not so easy to find even in my spiced neighborhood and I wanted to bring back home a few scented souvenirs of my trip, to keep experimenting with them. In a world where every product it’s just a paypal click-away from you, it probably sounds like no-sense. But, now back home, im my tiny kitchen, when I put my nose inside my jars and I close my eyes, it suddenly comes to mind the gentle vendors we made a lot of effort to communicate with, their shop, their smiles..Well: nostalgia in a bottle, I guess. As far as I know Sumac es 100% a turkish thing, at least in the way they celebrate the use of it, the grounded dried fruits of the Rhus plant. The result is a bit acid, lemony taste. If you are in your middle-east age of your kitchen mood history, as I probably am from Israel, passing through Lebanon, Syria …finding a way to Persian cuisine..well this is a must-have spice. And Turkish Cuisine is my necessary next stop station! Sumac is in fact the main ingredient of other famous mix of spices, essential for mid eastern cooking: Zahtar. They say every cook here around has his own Zahtar home made mix. 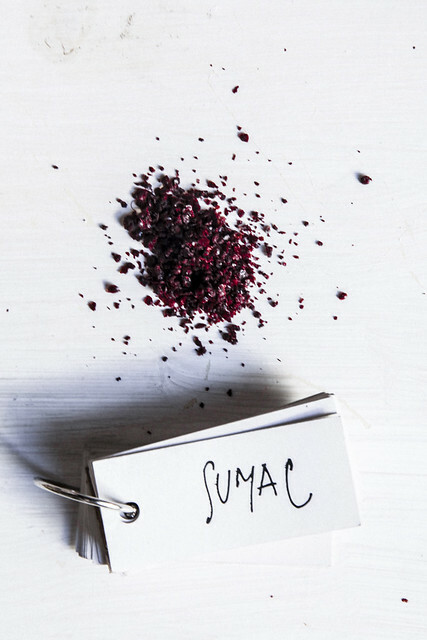 To prepare it sumac is key-ingredient together with thyme, toasted sesame seeds, mejoran, oregano and salt. Any kind of patties (and falafel of course will taste new..), fish, but also perfect for vinaigrettes with salads, with or without yoghurt, hummus, roasted eggplants or added to breads. Todo un mundo por descubrir! Although the big name of mideastern cuisine Ottolenghi recently declared that Pomegranate Molasse is not a food trend anymore , (I read this during my holiday randomly in some food magazine), I don’t really care because I just finally got my first bottle of this sticky treasure and I don’t really think of getting rid of it! Perfect substitute of honey or maple syrup for pancakes & tarts. But where I really makes the difference is in vinaigrette to dress up salads, stews and stir-fried veggies. Delicious. Of course there is a way to prepare the molasse hand-made but I wanted to taste first the industrial one to ..get familiar with! EIn our trip to the South of Turkey, we crossed with an idillic tiny town with a lake, Eğirdir, not so far from the turkish famous Isparta, called the “City of roses”. They industrial production is the number one in the country for rose collection and derivated products like tonic waterrose, creams, perfume bottles and ..jams. I resisted the temptation of trying the cosmetics they were everywhere selling. I mean the ROSE PINK was extremely PINK, with an amount of enough to probably paint your cheeks forever (and I am afraid I can say the same for most of the jams). But THAT JAM surprised me during a morning breakfast, facing the lake starting a beautiful day of walks in the nature. The colour was definitely not pink, but the taste warmed my heart. I suggest you to find that kind of rose jam. I totally fell in love withthis new bread&marmelade concepto and I suspect that it could be interesting to add a slice of jamón or a good cheese aside. About the dried petals: I could not resist! I bought them in Istanbul to scent teas & cookies. And ..salads. In Spain they call it se Pimienta de Aleppo, as if it were a type of Pepper spice, although Pul Biber is made actually of red pepper flakes. Turkish people love it even if originally comes from Syria. In the markets you can find plenty of varieties, more or less hot or fruity but it will always have this amazing sparkling red color and it’s unique “humidity” moisture. The perfect partner in crime with turkish breakfast eggs. To marinate kitchen, veggies..It basically took the place of “hot paprika” in my kitchen. Maybe for good. Being neighbor of this shop in Madrid where they bulk sell since generations any kind of grains, nuts ( plus for a cheap price), turkish offer didn’t blow my mind away but, while I was there, I tried walking through the markets some nice pick: sun dried apricots, black currants, apples, almonds and..impressive apricots seeds. They quite taste like almonds. But one thing I wanted to bring back home and I went with a bunch of fresh Antep pistachos, vacuum packed to resist the flight. If in Italy the best pistachos come from Bronte, Sicily, in Turkey the doc area is the province of Gaziantep, near the sirian frontier. I think every self-respecting “foodie” should spend a day in life in this old town (and with old I mean it for real: it’s one of most ancient town in the world), originally called Antep, where Baklava was invented, where otomana cuisine was shaped and where also exists a museum of turkish culinary traditions ..! You will find these pistachos everywhere in the markets, dried or fresh. The usual hard shell of a dried pistacho is hidden inside a blend dark second skin..so I admit it’s a bit tricky to open one but it deserves a shot, it tastes really different from the dried ones. Chopped inside a madeleine scented with rose water. All these gifts together could be an amazing gift for some mideastern foodie lover, right? Maybe you could also add a book like this of Refika (turkish chef prodly showing everything about Istanbul eat world, in english:). Don’t forget to bring home if you can a good selection of quality turkish cheese. They’re not export so much their production, they keep everything for theirselves! And I am not talking about feta, there is more and I have to thank this shop to introduce me to his amazing world: Antre Gourme). 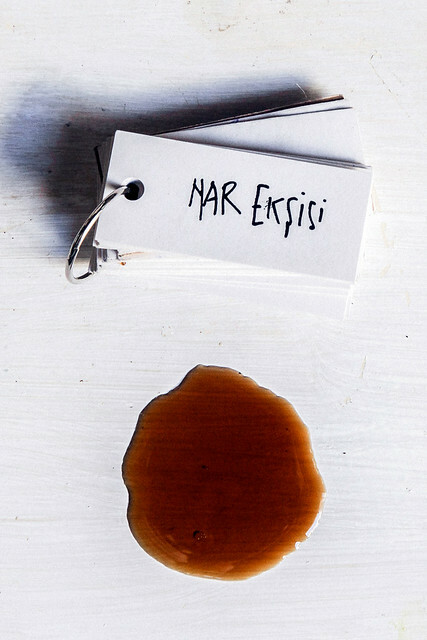 Then : of course the turkish coffee, (and it seems if you don’t buy here in Istanbul, you’re really missing something. I couldnt’ go..and I regret), honey, yufka fresh pastry and of course… lokum, the originals turkish delights actually, kind of a marshmallow in any taste or colour (I have to admit I felt a bit overwhelmed for the amount of low-quality turkish delight souvenir shop) but if you have the chance to find a good real pastry shop, home made are really worth to try. Don’t buy turkish saffron. It’s price lower, but it doesn’t taste for cooking. It’s more for medicamental use. Even turkish people use the iranian one in their kitchen. And me, coming from Spain. why bothering? Don’t buy that Apple tea you will always find near the turkish delight. It’s totally fake. The real tea is just black tea. And you can buy it in every super-market or tea-shop. And if you like the apple taste just add two pieces of dried apples in the teapot;). Also I am aware is a totally personal selection, based on my experience, my experienced travel and my taste, of course ;) If you discovered something more, I will be really glad to hear about in the comments! More about Turkey: read this to-do(and taste) list I prepared before leaving (in fact I checked everything in the list!). I will publish soon a mini-guide about Istanbul, that certainly deserves a focus, of course food oriented, with more pics & infos I recollected. By the moment you can have a look at the anagogic diary I shared with my beloved traveller companion : of a happy camera.